The hot weather here is driving me crazy ... haiz! 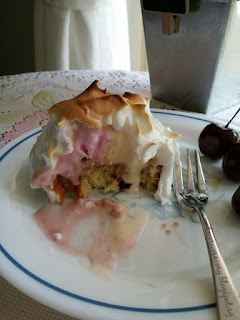 ... and I'm really out of my mind to make baked Alaska ! 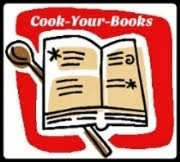 Recently, I've added a handy "Just 5 Ingredients Cakes & Desserts" recipes collection cookbook and bookmarked this recipe. And since I've got few tubs of ice-cream (store bought) in the freezer, and made a jam swiss roll for our weekend coffee snack ... so why not try this pretty easy to make Mini Baked Alaska with Swiss Roll. 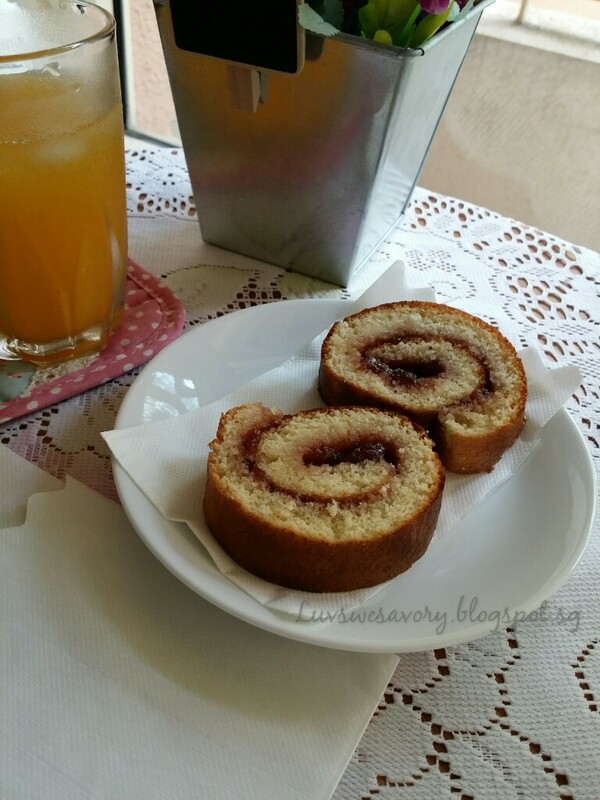 The swiss roll recipe adapted from Cakes and Bakes 500 Cookbook Martha Day. The original recipe is Almond & Raspberry Swiss Roll. My modified version below as I don’t have any raspberries and whipped cream for the filling, instead, I decided to use the bottle of strawberry jam idling in the fridge. 1. Preheat the oven to 190°C. Grease a 33 x 23 cm swiss roll tin and line with lightly greased parchment paper. 2. Whisk the eggs and caster sugar in a heatproof bowl until blended. Place the bowl over a pan of simmering water and whisk until thick and pale. (*note : I transferred the batter to the electric stand mixer bowl and continued to whisk until thick and creamy for about 6 - 8 minutes and when lifted the beater, the batter will fall back into the bowl in a slow ribbon). 3. Gently fold in the sifted flour and almonds with a spatula until just combined and smooth texture. 4. Pour the batter into the prepared tin, level the top with spatula. Gently tap the tin a few times on the table top to release the trapped bubbles in the batter. Bake for 10-12 minutes, or the top is evenly browned and springy to touch. 5. Invert the cake in its tin on to a clean sheet of parchment paper. Leave to cool about 3 minutes, then remove the tin and the lining paper. 6. Spread the strawberry jam over cake leaving about 1/2-inch border all around. 7. With the shorter side, gently but firmly roll the cake up into a Swiss roll. Place the rolled cake seam side down. Wrap with parchment paper and chill in the refrigerator for few hours. Trim the ends using a sharp knife. Cut into slices just before serving. 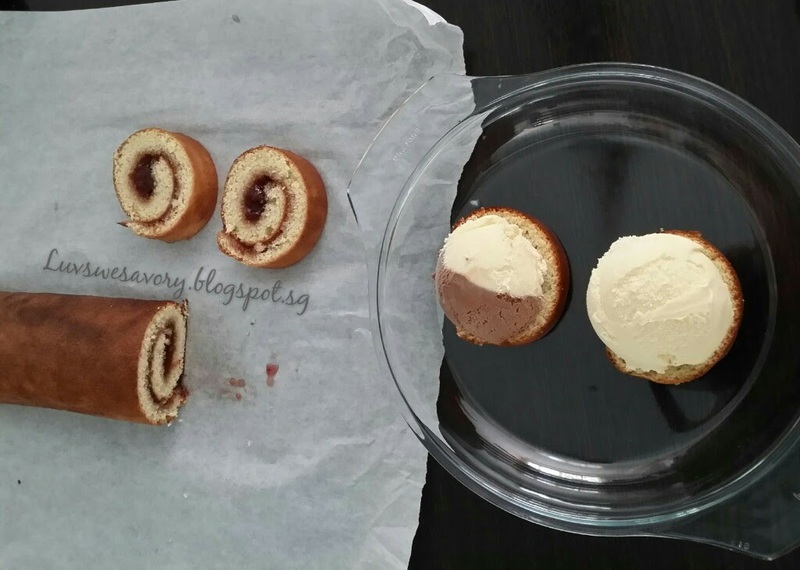 Arrange the slices of Swiss roll on a baking sheet. Top each with a scoop of ice-cream. Put into the freezer for 10 minutes or longer if you have time. Using the electric mixer, whisk the cold egg whites until stiff, moist-looking peaks form. Gradually whisk in the caster sugar for a few minutes until thick and glossy. Take out the Swiss roll with ice-cream from the freezer and quickly swirl the meringue over the top and sides to cover completely. 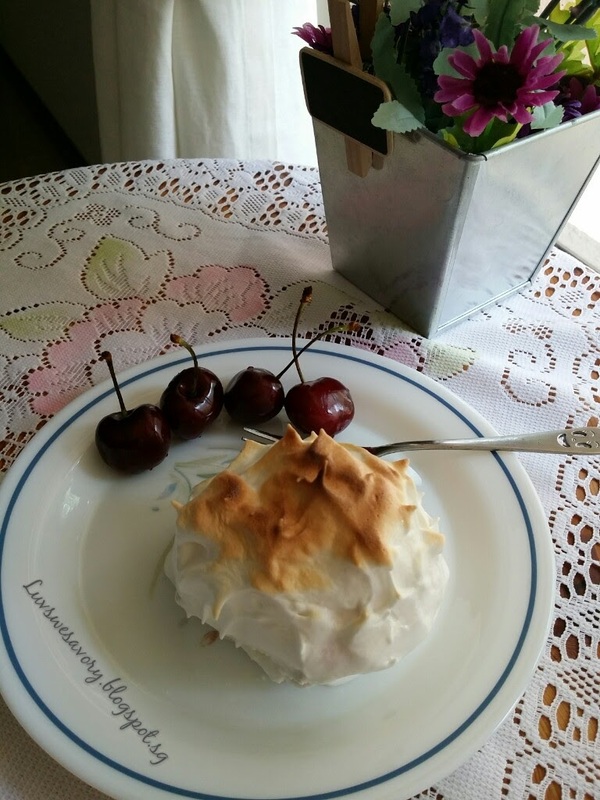 Cook on preheated oven at 190°C for 5 minutes until the peaks are golden brown, the meringue is cooked through and the ice-cream is only just beginning to soften. Quickly, transfer the baked Alaskas to shallow serving bowls and serve the dessert immediately. Must EAT these mini baked Alaskas immediately and I couldn't take my own sweet time to snap photos though ... else the ice-cream would soon become milkshake ! Very nice ! Enjoy ! 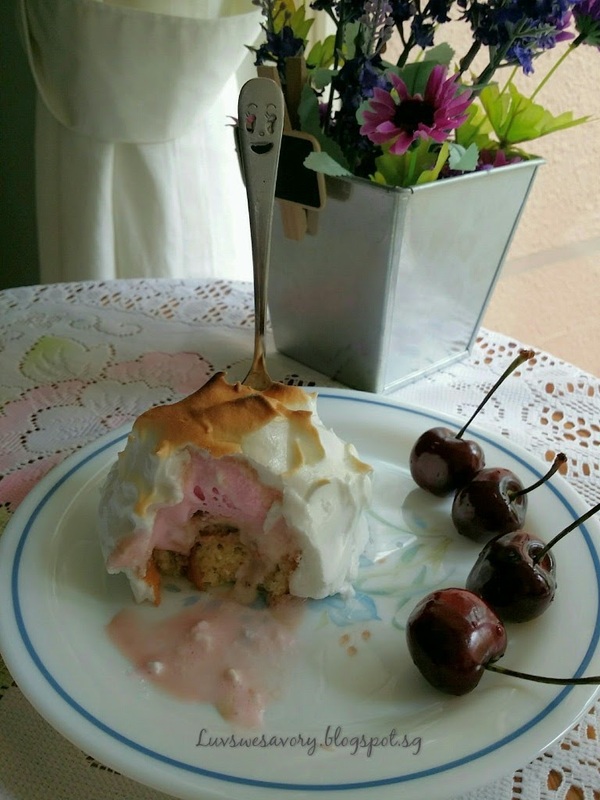 Our 2-in-1 Mini Baked Alaska with Swiss Roll. Happy baking & have a great week ahead ! I'm joining Best Recipes for Everyone June 2015 Event Theme: Secret of Chiffon & Roll Cakes. Hi Karen, this dessert looks so yummy! I am sure that Alaskan tasted delicious! Wow looks yummilicious...I must try this one day! 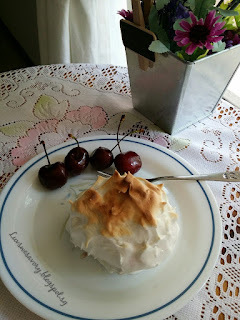 My girl has been asking me to make Baked Alaska for her but I have yet to fulfil her request. Karen, this is a very adventurous recipe! The combination of hot and cold must be really exciting. Such delightful baked alaska! I have never attempted to make this before. You are right, the super hot weather is making me very cranky!